French musicians are infamous for loving their liberté. Orchestras from past Gallic generations even admitted that they didn't want to play together. Whether in response to — or because of — that, the French composers on this week's Philadelphia Orchestra program wrote pieces for an orchestra of soloists from Saint-Saens to Franck to Dukas in the late 19th century, with all of those roads leading to Ravel in the 20th century. On the surface, the Thursday concert at the Kimmel Center felt like one of those ultra-safe programs from the orchestra's post-bankruptcy years. Maybe others felt the same: Lots of empty seats out there. The fast, perfunctory Danse Macabre, Saint-Saens' Halloween favorite, wasn't promising. 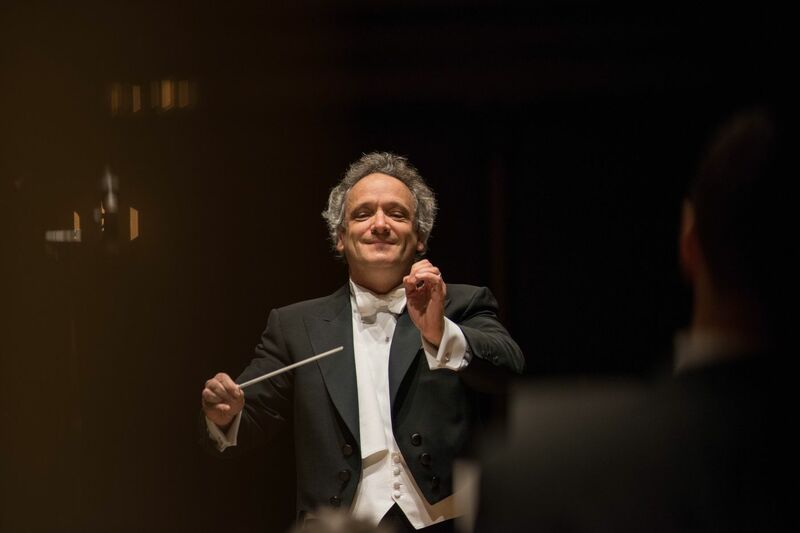 But guest conductor Louis Langrée assembles some of the savviest programs in North America with the Cincinnati Symphony (where he has been music director since 2013). During his summers at the Mostly Mozart Festival (music director since 2002), he can be seen in odd New York venues enjoying views at the edge. As it turned out, Danse Macabre was the first in a trio of musical appetizers, all contoured similarly and using more and more individualistic solos to represent characters in the music's narrative, whether Saint-Saens' dancing dead people or the title protagonists of Franck's The Accursed Huntsman and Dukas' Sorcerer's Apprentice. Langrée was particularly adept at projecting the Huntsman going to hell by highlighting the constant subtle shifts in orchestration. Lest we think the Philadelphia Orchestra was taking it easy with the Dukas favorite from the film Fantasia, The Sorcerer's Apprentice has a fearsomely intricate orchestration with incidental solos emerging from all points, especially the wind contingent, which has bassoons for days. The second-half Ravel pieces pursued narratives less literally. Originally written as a ballet, Daphnis et Chloe Suite No. 2 leaves much narrative work to the choreographer, concentrating more on the world the characters inhabit plus some light psychology. Though as orchestral as anything ever written, the piece's solos are among the greatest in the literature. How many times have we heard Jeffrey Khaner play the famous flute solo? But on Thursday, I'd never heard him play with more commitment — supported by Langrée's studiously keen ear for detail. Langrée preferred more of a chamber-size contingent for Ravel's Piano Concerto in G, revealing its similarities to Gershwin's seven-years-earlier Rhapsody in Blue in the original jazz-band arrangement. And speaking of liberté, that Gershwin score often fails to specify particular instruments but instead gives the first names of the musicians playing it. Ravel's more refined orchestration maintains that spirit, with the trombone cracking jokes and consoling wind soloists arriving in unlikely places, such as the middle of the sublime piano soliloquy in the second movement. Soloist Kirill Gerstein's fine cut-glass sonority and interpretive precision was an ideal match for the fractile-like detail in Ravel's writing. Though this concerto increasingly suffers from overexposure, Gersten's concentration made each nanosecond new, giving each note its own purpose. That's something different from giving each note meaning. Germanic composers such as Brahms invite explanation. With Ravel, there's no explaining beauty. It just is. The program is repeated 8 p.m. Friday and Saturday, Oct. 26 and 27, at the Kimmel Center. Tickets: $35-90. Information: 215-893-1999 or www.philorch.org.